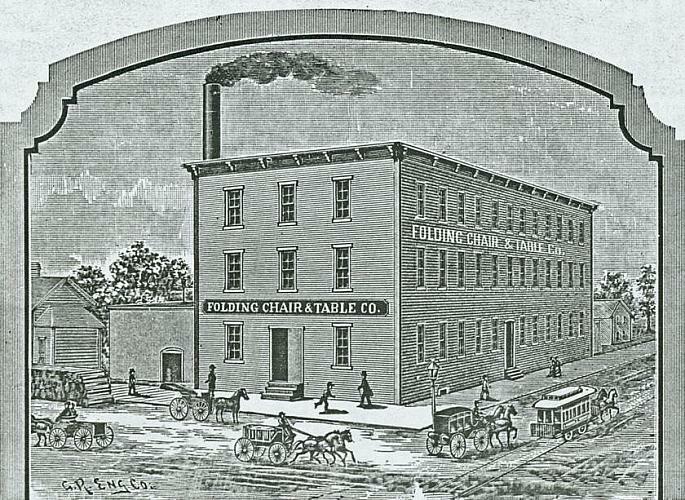 Folding Chair & Table Co. advertisement from Michigan Artisan, 1889. Folding Chair & Table Co. Manufacturer of folding chairs; bookcases and farmers' secretaries; and breakfast, kitchen extension, and folding tables. American Eastlake and faux bamboo styles, in maple, oak, and ash. Officers of the company were: W. B. Remington, President; J. F. Homan, Vice-Pres. ; A. J. Davidson, Secretary/Tresurer; W. H. Washer, Superintendent. The presidnet and vice-president took no active part in the business. Remington was of the Cleveland Wooden Manufactureing Co. of Midland and largely interested in lumber. Homan was a prominent jeweler in Grand Rapids and devoted his full attention to that business.